Private First Class (Pfc.) 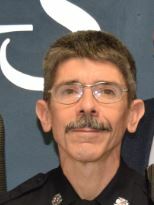 Vincent Kurek has been with the Maryland Capitol Police (MCP) Baltimore Detachment for 26 years. He also served in the National Guard for 20 years (1984 – 2004). Officer Kurek works the evening shift and leads the Detachment in traffic enforcement. A team player, he is always willing to assist fellow officers with preparing their reports, or work a special detail, or volunteer for overtime details both in Baltimore and Annapolis. Officer Kurek responded to 6 St. Paul St. on the evening of January 4 for a report of a vehicle slamming into the William Donald Schafer building. Upon arrival, Pfc. Kurek took charge of the accident scene, rendering aide to the pregnant driver of the vehicle and ensuring that a medic was called to the scene to treat the driver. Shortly after, the vehicle caught fire and caused additional damage to the building, with the Fire Department responding. The whole incident attracted bystanders and slowed traffic; Pfc. Kurek, along with Baltimore City Police and additional MCP officers, controlled the crowd and protected the scene. After he got the scene under control, Officer Kurek was able to investigate the accident further, resulting in the identification of another driver who was responsible for the accident at the intersection of Fayette and St. Paul streets. He reviewed video footage of the accident that showed second driver had failed to stop at a red light and collided with the first vehicle, causing it to collide with the William Donald Schafer building. It was Pfc. Kurek’s rapid response in taking charge of scene that prevented further injury to the accident victim and the building. His immediate follow-up investigation identified the driver who caused the accident. For his response to this serious accident and successful follow-up investigation, Officer Kurek was nominated for Caught Doing Great Service at the recommendation of his supervisor, Sgt. Ronald Kennedy. Roderick Rinon has been Chief Engineer of the State Center power plant for six years. He oversees a $1.5 million budget, manages a staff of nine engineers (three positions are vacant), and monitors the performance of FOM’s power plant preventative maintenance contractor, Vieolia North America. He and his team maintain and service the four buildings that make up the State Center Complex, as well as the Maryland Department of Public Safety and Correctional Services Building at 2100 N. Gilford Avenue. Rod is a dedicated employee who enjoys his job on behalf of his co-workers at State Center. He can be seen throughout the complex at various hours – early mornings or late evenings – making sure all of our buildings are comfortable and ready for business. Whenever temperatures are off – a little too cold or a little too hot – Rod and his engineers get the call. Rod has been doing an exceptional job leading his team while the power plant is down three engineers. Most recently, he oversaw the implementation a new building automation system that makes it possible for the power plant to operate more efficiently. His commitment to service and dedication to duty are the reasons he was “Caught DGSing” by Baltimore Public Buildings and Grounds.